Here the meat and dairy products are of excellent quality, since all the local cattle is raised in the most natural conditions. From the imense sea around come the fresh fish and seafood and, although the numbers are decreasing, this is also applicable to fruit and vegetables grown on the island. 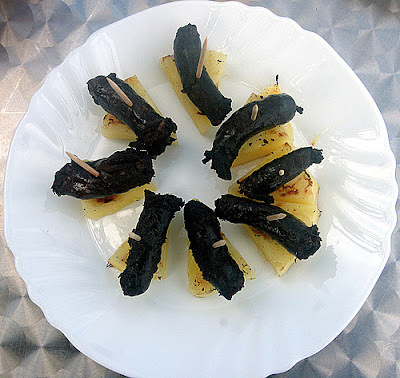 The specialties of Faial that are served in practically ever restaurant include mouthwatering dishes of linguiça (sausage) and inhames (yams), molha de carne (roast meat), delicacies like morcelas and torresmos de vinha-de-alhos that one can only perceive after having tasted, sopas do Espírito Santo (Holy Ghost soup), fish soup, caldeirada (a must try), polvo guisado com vinho (octopus stewed in wine), and accompanied by pão e bolo de milho (corn bread and cake), and massa sovada. Moreover, there is a wide variety of seafood and shellfish available such as lobster, cavaco, deep-water crab and rice of lapas, all extremely well prepared and delicious. There are fine homemade liqueurs of coffee and milk, but the wine comes from Pico.